DELI SERDANG - The Government's commitment to support new renewable energy is re-realized. Wednesday (26/9), in the village of Tanjung Selamat, Percut Sei Tuan District, Deli Serdang Regency, North Sumatra, the signing of the Deli Serdang Electric Power Sale and Purchase Agreement (PJBL) Biomass Power Plant(PLTBm) with a capacity of 1 x 9 was carried out. 9 MW between PT PLN (Persero) North Sumatra Region and PT Cipta Multi Listrik Nasional. Deli Serdang PLTBm utilizes rubber wood biomass from replanting rubber plantations owned by PTPN III. The construction of the PLTBm requires an investment of around Rp 340 billion and is targeted for Commercial Operation Date (COD) in September 2020. The signing was witnessed by representatives of the Directorate General of Electricity, the Directorate General of Renewable Energy and Energy Conservation (EBTKE), and PT PLN (Persero) Head Office . The operation of Deli Serdang Biomass Power Plant (PLTBm ) in North Sumatra will potentially reduce the use of Diesel Power Plant (PLTD) in North Sumatra, which means that it will save the use of BBM for PLTD around 17,000 kilo liters per year and when compared to Diesel Power Plant (PLTD) it will save around Rp 98 billion per year. The signing of the PPA is a continuation of the signing of the EBT plant PPA in 2017 with a total capacity of 1,189.22 MW. The total electricity generation from renewable energy that has signed the PPA is 1,199.12 MW. The signing of the PPA is one of the concrete proofs of the Government's efforts to meet the target of 23% renewable energy mix by 2025, and to create competitive and affordable electricity prices. Electric Power Network Selling and Leasing Price Section Head, Ario Panggi Pramono Jati said, "Deli Serdang PLTBM PPA follows the ESDM Minister Regulation Number 50 of 2017, where the scheme is BOOT (Build, Own, Operate, and Transfer) with a contract period of 25 year. 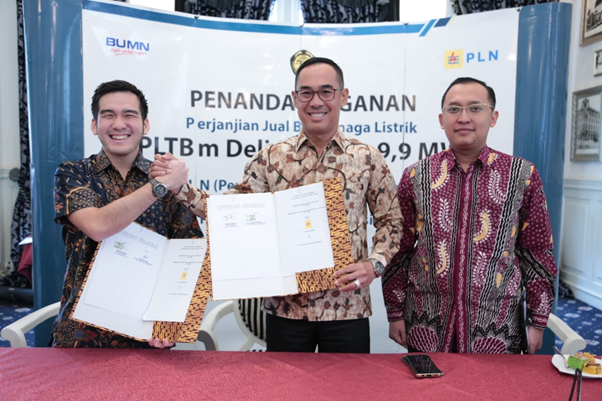 In this regulation, the purchase price of electricity from the PLTBm in North Sumatra is set at a maximum of 85% of the BPP generation of local systems. " This is because the BPP Generation in North Sumatra is above the average National Generation BPP. This shows that the ESDM Ministerial Regulation No. 50 of 2017 is workable for the development of renewable energy in Indonesia.